Performance: Faster cruise M0.78, Higher ceiling 41,000ft, Lower take-off & approach speeds, Higher MTOW, lower fuel burn. Engines: FADEC controlled CFM56-7, 2.5deg nozzle tilt, redesigned struts, improved nacelles with increased airflow and improved noise treatment, 7% more fuel efficient than CFM56-3. Fuselage: Strengthened for increased tail loads and design weights, new wing-body strake. Wings: New airfoil section, 25% increase in area, 107" semi-span increase, 17" chord increase, raked wing-tip, larger inspar wingbox with machined ribs. Fuel Tanks: Main tanks smaller at 3900kg each but centre tank much larger giving total fuel capacity of 20,800kg. (compared to 16,200kg on classics). Tail: 4ft 8in taller, 60 sq ft root insert, modified rudder, segmented rudder seals, digital yaw damper. Flight Controls: Increased elevator PCU capability, aileron and tab span increase, new double slotted continuous span flaps, new leading edge Krueger flaps, additional slat, additional spoiler. Nose Gear: Stroke increased 3.5" to relieve higher dynamic loads and wheelwell extended 3" forward. Main Gear: Longer to reduce tailstrike risk, one piece titanium gear beam, 43.5" tyres, digital antiskid. Flightdeck: 6 programmable LCD's, replacing EFIS CRT displays and most conventional instruments. Systems: Most systems developed particularly: electrics, powerplant & navigation. The NG's have 33% fewer parts than the Classics which reduces production time. One of the main production differences with the NG is the single moving assembly line, this has the capacity to produce 21 aircraft a month with a flow time of just 13 days. The 737 NG Performance Improvement Package (PIP) was a series of aerodynamic and engine improvements including refined wing control surfaces, redesigned wheel-well fairing, a streamlined anti-collision light, ECS inlet/exhaust modulation and the new CFM56-7BE "Evolution" engine (see powerplant). The total fuel saving with PIP is 2%. The PIP was introduced as standard into production 737 NGs in stages from line number 3570 in March 2011 to line number 4302 in December 2012. Some of these improvements have also been made available for retrofit to earlier NGs. 9 Feb 1997: The first Boeing 737-700 makes its maiden flight, with Boeing Capts. Mike Hewett and Ken Higgins at the airplane's controls. At 10:05 a.m. PST, the aircraft took-off from Renton Municipal Airport. After heading north over Lake Washington, the pilots flew north over Tattoosh, east to Spokane and then back to Western Washington before landing at Boeing Field in Seattle. 15 Mar 1997: The 737-700 reaches an altitude of 41,000 feet, flying higher than any other 737 in aviation history. Flying up to speeds of 0.81 Mach, Boeing Capts. Mike Carriker and Paul Desrochers fly the second 737-700 flight-test airplane to its new altitude during certification testing for climb and descent. 1 Apr 1997: The last 737-700 flight-test airplane makes its first flight at 10:55 a.m. and lands 1 hour and 47 minutes later at Boeing Field. 22 Apr 1997: YA001, the first 737-700, makes its 100th flight weighing 172,900 pounds -- the highest Boeing 737 takeoff weight ever -- and with an engine thrust of 27,000 pounds. During the flight the airplane conducts pre-certification flight testing to capture data for the 737-700 Increased Gross Weight (IGW) airplane. Commenting on the flight, Capt. Mike Hewett said the airplane's wings performed exceptionally well and "the stability control data points looked very good for the flight-test conditions." 31 Jul 1997: The 737-800 makes its first flight, with Boeing Capts. Mike Hewett and Jim McRoberts at the airplane's controls. At 9 a.m. PDT, the 129-foot, 6-inch 737-800 takes off from Renton Municipal Airport in Renton, Wash. After heading north over Lake Washington, the pilots fly north to the Straits of Juan de Fuca and conduct a series of flight tests between there and Tatoosh. Three hours and five minutes later, the airplane lands at Boeing Field, Seattle. 3 Sep 1997: Boeing launches the 737-700C with an order for two from the U.S. Navy. The Navy calls the model, a cargo version of the 737-700, the C-40. 7 Nov 1997: The 737-700, earns type certification from the U.S. Federal Aviation Administration (FAA). The certification formally recognizes that the newest 737 airplane has passed all the stringent testing requirements mandated by the FAA and is ready to enter passenger service. 10 Nov 1997: Alaska Airlines announces an order for 10 737-900s and 10 options, launching the series. The aircraft is the longest 737 built, with a length of 138 feet 2 inches. 8 Dec 1997: Exactly a year to the date after the world premier of the first Next-Generation 737-700, the first 737-600 rolls out of the Renton factory. The ceremonial event marks the manufacturing completion of the 102-foot-6-inch airplane -- the smallest member of the Next-Generation 737 airplane family. The airplane will be the first of three 737-600s that will participate in the 737-600 flight testing and certification program. 17 Dec 1997: Boeing delivers the first 737 NG - a 737-700 to launch customer Southwest Airlines. The event is marked by a brief ceremony at Boeing Field. The airplane later departs for Love Field in Dallas, Texas. 22 Jan 1998: The Boeing 737-600 makes its first flight. 19 Feb 1998: Europe's Joint Aviation Authorities (JAA), which comprise the aviation regulatory authorities of 27 countries, recommends type validation of the 737-700. The individual countries will award actual type certificates. 13 Mar 1998: The 737-800 earns FAA type certification. JAA follow suit on 9 Apr 1998. 14 Aug 1998: The 737-600 earns FAA type certification. JAA follow suit on 10 Sep 1998. 1 Sep 1999: 737 NGs are certified for 180 minute ETOPS Operation. 11 Oct 1999: Boeing launches a second Boeing Business Jet model, the BBJ-2, a modified version of the Next-Generation 737-800. 14 Feb 2000: Aloha Airlines begins first 180-minute ETOPS service, introducing Nonstop service between Honolulu and Oakland, Calif.
27 Jan 2000: The 737 becomes the first jetliner in history to pass 100 million flight hours. 18 Feb 2000: Boeing announces availability of advanced technology "blended" winglets as an option on Next-Generation 737-800. 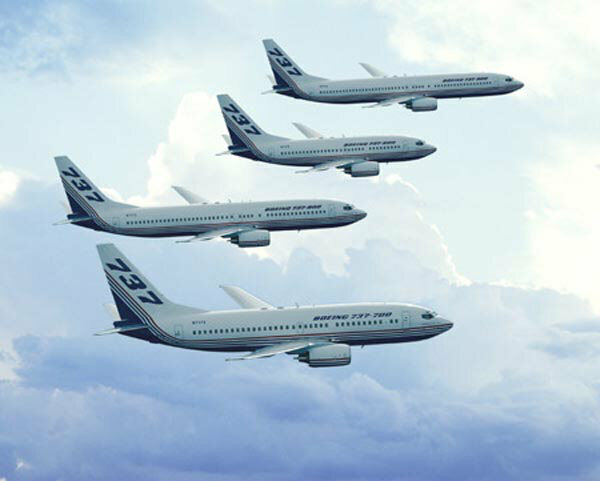 14 Apr 2000: First flight of the 737-700C. 3 Aug 2000: First flight of the 737-900. Flight-test program begins. 26 Sep 2000: First flight of the 737 with blended winglets. 17 Apr 2001: The 737-900 earns FAA type certification. JAA follow suit on 19 Apr 2001. 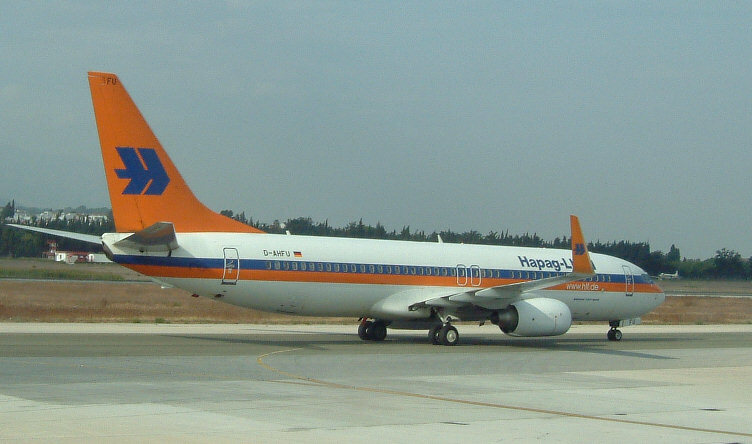 8 May 2001: "Blended" winglets make their world debut in revenue service with German carrier Hapag-Lloyd Flug. 17 Sep 2001: BBJ adds Flight Dynamics' latest head-up guidance system. 2 Nov 2001: Boeing delivers first Next-Generation 737-700 Convertible with Quick Change options. 19 Mar 2002: Boeing introduces the Technology Demonstrator airplane, a 737-900 outfitted with a suite of new and emerging flight deck technologies to assess their value for enhancing safety, capacity and operational efficiency across the Boeing fleet of airplanes. 9 Sep 2002: Boeing Business Jets announced the availability of a lower cabin altitude modification for BBJ operators. The new feature will offer 6,500-foot cabin altitude instead of the standard 8,000-foot cabin, providing passengers with an improved level of comfort. 31 Oct 2002: Rollout of the 737 AEW&C - "Wedgetail". 28 Jan 2003: Boeing delivers a suite of three leading-edge display and flight management software for the 737. The new flight-deck technologies, which include the Vertical Situation Display (VSD), Navigation Performance Scales (NPS) and Integrated Approach Navigation (IAN), promise to reduce flight delays and enhance flight-crew efficiency. 13 Jun 2003: The Next-Generation 737 fleet surpasses 10 million flight hours within five years of entering service, a record and a feat equal to one airplane flying more than 1,141 years nonstop. 12 Oct 2004: Boeing Electronic Flight Bag available for retrofit on BBJ. Boeing is offering an avionics-installed "Class 3" version of the EFB comprising Jeppesen software and data, and electronics and display hardware from Astronautics Corp. of America. 21 May 2004: First flight of the 737 AEW&C - "Wedgetail". Flight-test program begins. 24 May 2004: A BBJ completes the first North Atlantic flight by a business jet equipped with the advanced Future Air Navigation System (FANS), a system that streamlines communication between airplane crews and air-traffic controllers. 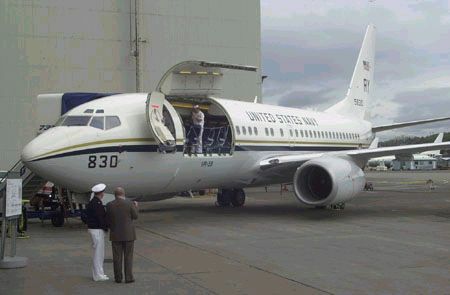 14 Jun 2004: The U.S. Navy awards The Boeing Company a System Development and Demonstration contract worth $3.89 billion for 109 of the Multi-mission Maritime Aircraft, which is based on the 737-800. 24 Jan 2005: The first Next-Generation 737 without "eyebrow" windows rolled out of Renton. The first eyebrowless aircraft was 737-700, N201LV, L/N 1650, first flown on 3 Feb 2005 and was delivered to Southwest 16 Feb 2005. 12 May 2005: 737NG First airliner to be certified for Cat I GLS approaches. 18 July 2005: 737-900ER Launched. 1 Feb 2007: FAA certification of the 737-700ER. 20 Apr 2007: FAA certification of the 737-900ER. 1 Aug 2008: First 737 delivered with carbon brakes to Delta Air Lines on a 737-700. 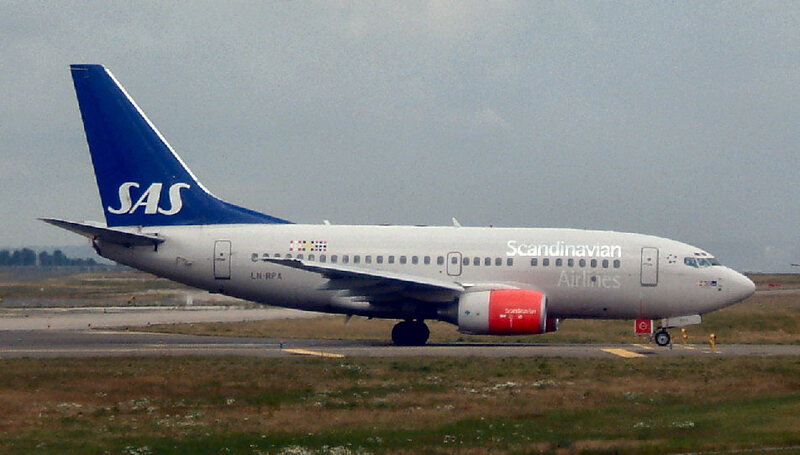 16 Apr 2009: Boeing delivers its 6,000th 737 to ILFC and operator Norwegian Air Shuttle. 27 Apr 2009: First flight of P-8A Poseidon. 21 July 2011: Delivery of the first 737 with 7BE engines. The 737-600 was the third of the NG's to be built and originated as the 737-500X with a similar length fuselage, seating between 108-132. The launch order came from SAS on 15 March 1995. The fuselage is essentially that of the -700, with two plugs of 1.37m (fwd) and 1.01m (aft) removed giving an overall length of 31.2m (102ft 6in). Forward cargo door and crew oxy bottle installation of the 737-500. Locally increased gauge on wingtip skin panels to avoid flutter. Wing-to-body faring modified to fit aft fuselage contour. 1152 delivered, approx 1039 in service (exc BBJs). This was the first of the NG's to fly. The first -700 was retrofitted with winglets on 11 Sept 2001 for Kenya Airways. 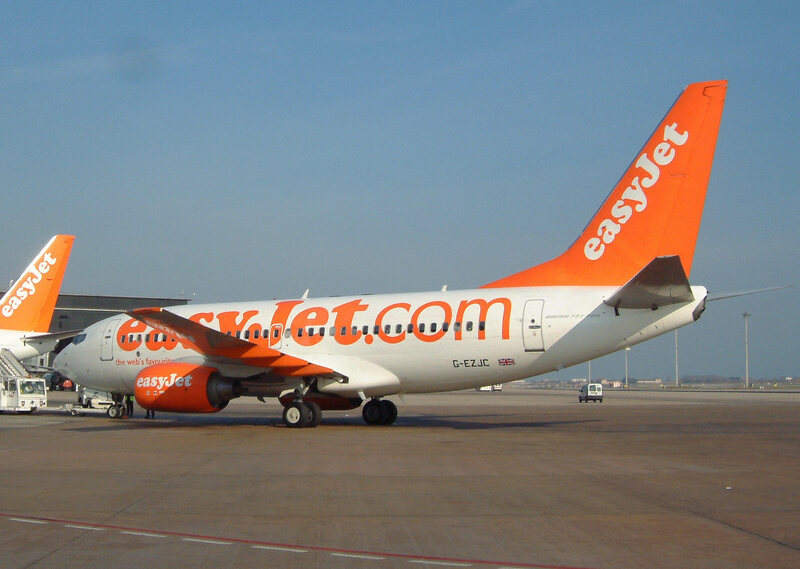 The 737-700C (Convertible) has a 3.4 x 2.1m side cargo door and can carry 18,780kg of cargo on eight pallets. The ceiling, sidewalls and overhead bins remain in the interior while the airplane is configured for cargo. There have been 21 737-700Cs ordered, mostly for the US Navy where they are known as C40As. The 737-700ER is an all business class long range airliner, similar to the BBJ. It has a range of 5500nm an should enter service in early 2007. The 737-400X became the 737-800 but is significantly longer at 39.4m (129ft 6in) and seats up to 189. The project was launched on 5 September 1994, with commitments for over 40. First delivery was to Hapag Lloyd in April 1998. This is by far the most successful series of 737 and the huge backlog of orders will ensure the 737's production until at least 2012. Fuselage plugs of 3m (fwd) and (2.84m (aft). Engine thrust increased to 27,300Lbs. Tailskid added to section 48 (same as -400). Environmental Control System riser ducts added (same as -400). Re-gauged skins and stringers in wing and centre section. 44.5in (1.13m) tyres, heavy-duty wheels and brakes. Resized main landing gear structure. The -800 has been available with winglets either as standard or retrofit since May 2001. These reduce aerodynamic drag thereby reducing fuel consumption by up to 7%. A short field performance improvement package was developed in 2005/6 to allow GOL airlines to operate their 737-800's into the 1,323m (4,341ft) Santos Dumont airport. Since then it has also become an option on all 737-800's and standard on the 737-900ER. This is a proposed heavier (83,500kg MTOW), longer range version of the -800 designed to meet the needs of the MMA. Due for delivery in 2007, it will have various components from the -900X (see below) including its heavier gauge wing, nose & main gear and section 44 (wing-body join section). It will also have some parts from the BBJ1. Unique features to the -800ERX will include strengthening to the empennage. 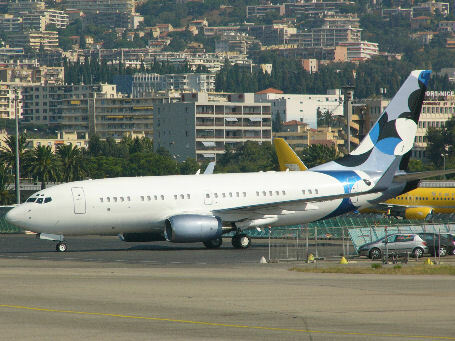 Boeing began work on the 737-900 in April 1997 which was stretched to compete with the 185/220 seat, Airbus A321. It featured a 2.4m (7ft 10in) fuselage extension giving it an overall length of 42.1m (138ft 3in), actually 40cm longer than the 707-120. The 900 has 9% more cabin floor space and 18% more cargo space than the -800; however Boeing opted to use the same NG emergency exit layout, with 4 main exit doors and 4 overwing exits, thereby still restricting the maximum passenger load to 189. Due to slow sales it has been succeeded by the 737-900ER. Boeing revealed the 737-900F study group in Sept 2003. The project was believed to be aimed at FedEx who are looking to replace their 727 fleet. It would use the side cargo door from the 700QC and be capable of taking 11 standard 2.24 x 3.18m pallets, 3 more than the -700QC and only 3 less than the 757. The -900 also has a hold volume of 51.7cu.m. This project is now believed to be shelved. The -900ER (formerly known as the -900X) has the same length fuselage as the -900. Seating for up to 215 passengers has been achieved by adding a pair of Type II doors aft of the wing for passenger evacuation regulations and installing a new flattened aft pressure bulkhead which would add an extra fuselage frame (approx 1 row of seats) of cabin space. The flat bulkhead will become standard on all 737s from 2006 and the Type II door will be standard on all series 900s although operators may choose to have it deactivated. Range is increased to 3,200nm with the addition of two 1,970ltr aux fuel tanks (or 2,800nm without aux tanks) and optional winglets. The 900ER will have reinforced landing gear legs, wing-box and keel beam structure to handle the increased MTOW of 85,139kg (187,700lbs). Take-off and landing speeds (and hence field length) are reduced by the short field performance improvement package originally developed for the 737-800, this is standard on all 737-900ERs. MZFW will be 67,721kg (149,500lbs) & MLW 71,400kg (157,500lbs), making it similar in weight to the 727-200; the brakes will be upgraded as a consequence. Production started in 2006 followed by a two aircraft, 7 month, flight test program starting 1 Sep 2006. FAA certification was gained on 26 Apr 2007 with the first aircraft delivered to Lion Air the following day. 119 BBJ1, 21 BBJ2, 7 BBJ3 & 1 BBJC ordered. A corporate version of the 737-700 dubbed the Boeing Business Jet (BBJ) was launched on 2nd July 1996 as a joint venture between Boeing and General Electric. It combines the fuselage of a 737-700 with the strengthened wings and undercarriage of the 737-800. Up to 12 fuel tanks, giving 37,712kg of fuel can be fitted as a customer option. The BBJ pictured here (N737ER) was designed for medical evacuations and charter operations and flew a record 6,854 nautical miles (12,694 kilometres) from Seattle to Jeddah in 14 hrs 12 minutes. The aircraft still landed with 2,700kg of fuel remaining! So far private individuals have bought 40% of the BBJs. Another 36% have been bought for government heads of state and the rest were sold to corporations and jet charter operators. There is also a BBJC which is a BBJ with a side cargo door which is aimed at governments which may have multi-mission requirements.This is effectively a 737-700C. The BBJ2 (see photo left) has the 737-800 fuselage, wings and undercarriage. It has 25% more cabin space and twice the cargo space or aux fuel tank space of the BBJ1. The BBJ3 is based on the 737-900ER and will be available from mid-2008. It has 1120 square feet of cabin space and a range of over 5400nm with 5 aux fuel tanks. Externally BBJ's usually differ from standard production 7/8/900's by having various windows blanked to accommodate interior fittings and more antennas for comms equipment. All have winglets. The BBJ2 only has one overwing exit each side because it does not need any more with the few passengers that are carried. Boeing is also looking at producing a convertible cargo version of the BBJ based on the 737-700C. The 737 MAX is also being offered as a BBJ. The BBJ 2 MAX, based upon the MAX 8, will have a potential range of 6,200nm. 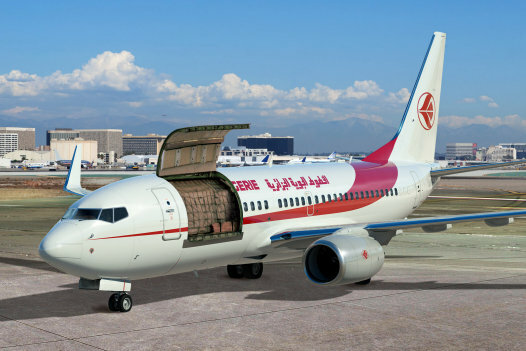 The Aeronautical Engineers Inc. (AEI) B737-800SF Cargo Conversion consists of the installation of a 86" x 140" cargo door on the left side of the fuselage, and modificationn of main deck to a Class E cargo compartment. After conversion the aircraft can carry eleven 88" x 125" AAA full height containers or pallets plus one AEP/AEH, with pallet weights up to 9,000 lbs. The cargo door is hydraulically operated and actuated from the inside of the aircraft by a independent system. Hydraulic pressure is available from two sources: a 28VDC electrically operated hydraulic pump or a manual hand pump. The door control and manual pump are located on the 9g barrier, allowing a single person to operate the door manually. The 737-800SF is expected to achieve US FAA supplemental type certification in 2017. The 737-700 Convertible has the same hybrid airframe as the BBJ1 with -700 fuselage and -800 wings. It also has a forward cargo door a new cargo handling system and an increased gross weight. In the passenger layout, the 737-700C Quick Change can carry up to 149 passengers. In the cargo configuration, The 737-700C can carry up to 18,780 kg (41,420 pounds) of cargo on eight pallets and has a range of 2880nm. The ceiling, sidewalls and overhead bins remain in the interior while the airplane is configured for cargo. The Quick Change option is simply a 737-700C with pallet-mounted seats. This reduces the conversion time from passenger to freighter configuration, and vice-versa, from 5 hours to 1 hour. The Convertible program was launched in 1997 but has only had 3 civilian customers. Two were delivered to Saudi Aramco in 2001, one was delivered to SonAir in 2008 and two more have been delivered to Air Algerie, the last in 2016. Most of the sales have been to the US military as the C-40 and one as a BBJC. Total sales are 21. 737-700C - "Convertible" Baseline aircraft, -700 fuselage and -800 wings. BBJC - A -700C with BBJ luxury interior for VIP or government. 737-700FC - FlexCombi, three configuration combo by PEMCO. Orders: 8 C-40A, 4 C-40B, 3 C-40C. The C-40 family are the US military versions of the 737. All have the -700 fuselage combined with the stronger -800 wing and landing gear, similar to a BBJ1. C-40A: US Navy, Fleet logistics support aircraft. Certified to operate in an all-passenger configuration (121 passengers), an all-cargo variant or a "combi" configuration that will accommodate up to three cargo pallets and 70 passengers on the main deck. For further C-40A details click here. This is the only C-40 version without winglets. C-40B: US Air Force, High-priority personnel transport & communications aircraft. Modified C-40A to include distinguished visitor compartment for combatant commanders and communications system operator workstation. The C-40B is designed to be an "office in the sky" for senior military and government leaders. Communications are paramount aboard the C-40B which provides broadband data/video transmit and receive capability as well as clear and secure voice and data communication. It gives combatant commanders the ability to conduct business anywhere around the world using on-board Internet and local area network connections, improved telephones, satellites, television monitors, and facsimile and copy machines. The C-40B also has a computer-based passenger data system. C-40C: Air National Guard, High-priority personnel transport aircraft. Modified C-40A to include convertible cargo area. May be converted for medevac, passenger transport or distinguished visitors such as members of the Cabinet and Congress. The C-40C is not equipped with the advanced communications capability of the C-40B. Unique to the C-40C is the capability to change its configuration to accommodate from 42 to 111 passengers.